In its endless generosity, the sky is always ready to impress us with something unique. 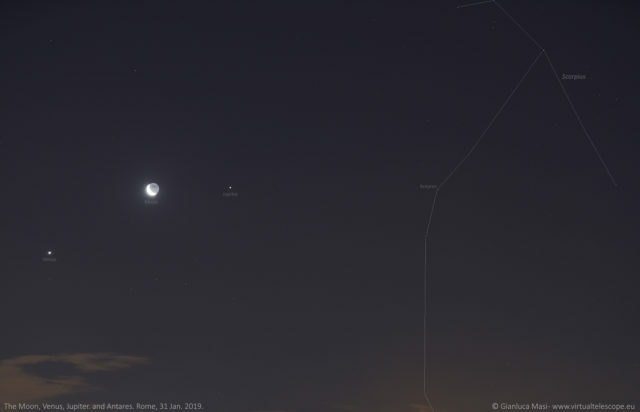 Yesterday morning, the Moon, Venus and Jupiter had a conjunction up there at dawn, offering a stunning sight. We managed to see it from Rome, adding the thrilling beauty of the Colosseum and the Roman Forum. Here we share some images. The end of January has been heavily cloudy and rainy in Central Italy. This is why I was almost sure I was going to miss the spectacular conjunction involving the Moon, Venus and Jupiter. But its beauty convinced me to try and hope in some good luck: this is why, despite the rain of the evening, I set my clock to wake up at 4.00 AM and reached the place I selected to image the show. The location was the Capitoline Hill in Rome, in particular the side overlooking the Roman Forum, with the legendary Colosseum on the distance. I simply love that location, as you might have noted looking at my photographic work. Waking up, I saw I was possibly lucky: while not perfectly clear, the sky was at least promising, so I quickly reached by car the selected site and managed to set up my imaging gear. I had my Canon 5DmIV DSLR and my 70-200/2.8 lens, which is perfect for astronomical shows like the one I wanted to capture. To be honest, clouds were filling the South-Eastern horizon, where the three objects were expected to show, but at least I was ready to go! 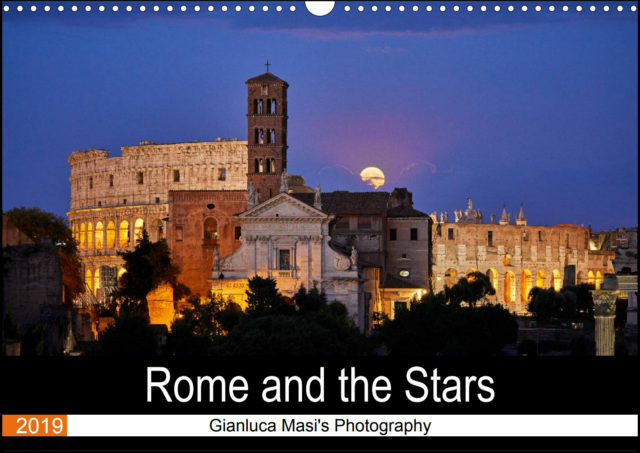 “Rome and the Stars”: now available, free international shipping. 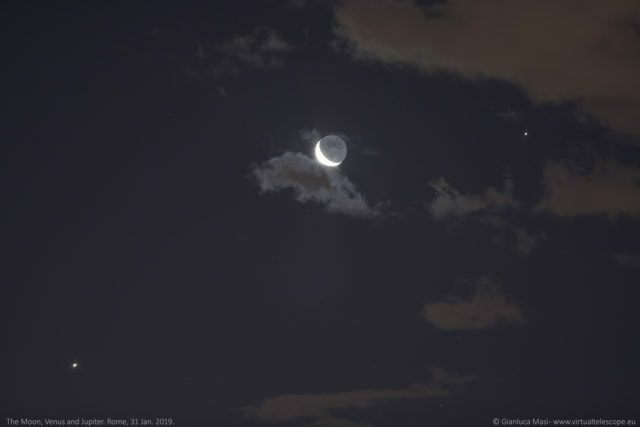 The weather evolved quickly and soon I could see the Moon and Venus through the clouds, better and better. I started taking images, but still was missing Jupiter. Then, the largest planet showed, too, and I was so happy I decided to go out despite the terrible weather of the evening. Lucky man! Looking at the Moon, with its earthshine, Venus and Jupiter, while some delicate clouds were moving all around was awesome. I really love the image above, telling the essential beauty of the night sky. Of course, clouds could come back at any moment, so I concentrated on my photographic work, grabbing the cosmic show above the Roman Forum, the Colosseum and the Palatine Hill (see the image at the beginning of this story). 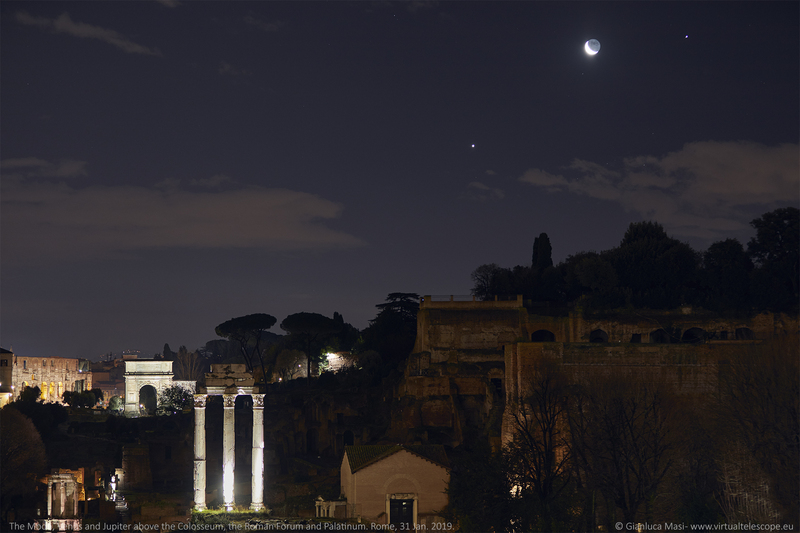 I wanted to isolate the view above the Palatine Hill, enveloped in its fascinating darkness. 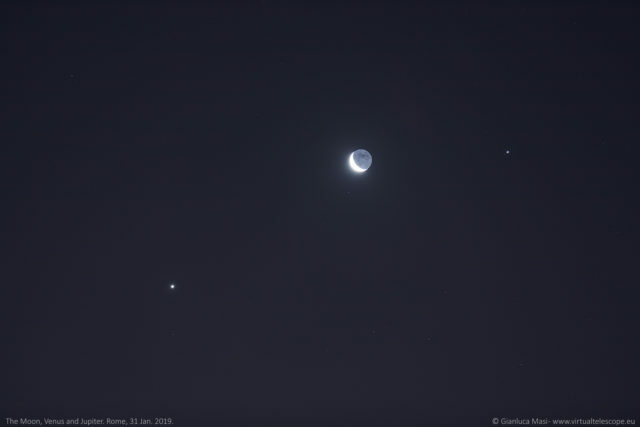 I must admit to be deeply fascinated by the earthshine, the solar light our Earth reflects to the Moon, making the dark part of our satellite visible to our eyes. 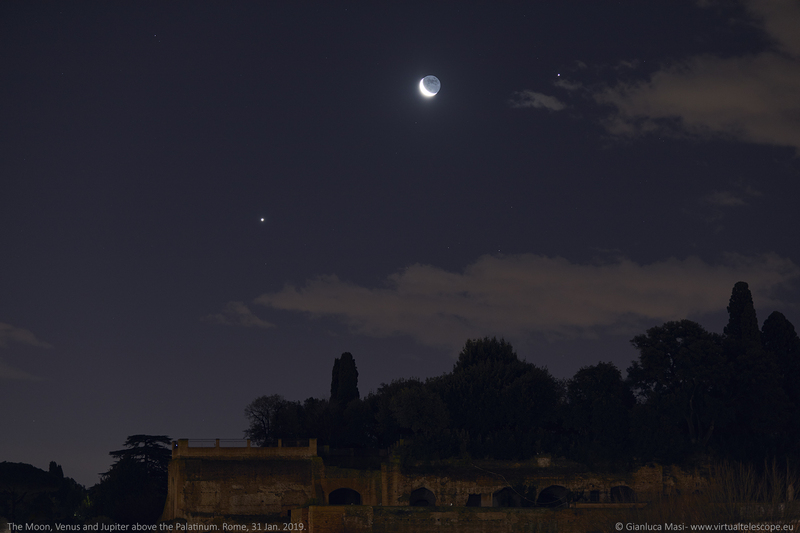 I cannot stay without looking at it every time the Moon “dresses” it, so imagine how much more exciting the vision was, with the two brightest planets in our sky joining our Moon and its wonderful light. Soon it was time for me to leave. I was happy I was able to see this unique show and I also appreciated the stars all around, with the limitations of light pollution, of course. Antares, the brightest star of Scorpius, was about 10 degrees east of Jupiter, so I managed to take a final image showing that star, too, as well as the head of Scorpius. I hope these images bring to you the wonder and the emotions I could feel there, meantime I’m looking forward to capture and share more beauty from the skies! Previous story 21 Jan. 2019 SuperMoon Total Eclipse – live event, online!